Geotypografika » Blog Archive » For club or country? Russia manager Hiddink considered for Chelsea vacancy. 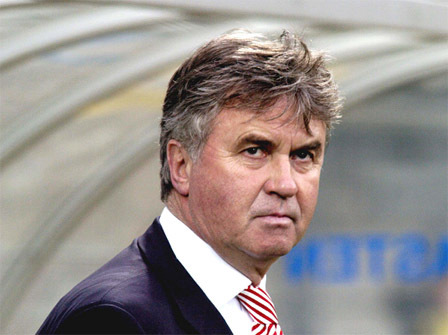 Above: Guus Hiddink. This is fascinating. According to CNN International, Chelsea have received permission to negotiate with Hiddink for their managing vacancy. Roman Abramovich, Chelsea owner, is also the dominant financier and voice of the Russian national side. Permission to “negotiate” could not have been difficult to secure. Which project is more important to the owner? National pride (Russia has been steamrolling for some time now under Hiddink), or the promise of the international markets (where Chelsea products clearly dominate)? And again we are left to wonder, what of our belo jogo? reports as Chelsea does the numbers. This entry was posted by Erik Brandt on Tuesday, February 10th, 2009 at 9:31 AM	and is filed under Aktuell, Education, Fussball, Globalization, International, Internet, News Links, Typografika.